Scenes, I note, seldom illustrate my relation with Vanessa; it has been too deep for ‘scenes’. Vanessa and I were both what we call tomboys; that is, we played cricket, scrambled over rocks, climbed trees, were said not to care for clothes and so on. Until she was fifteen indeed, she was outwardly sober and austere, the most trustworthy, and always the eldest; sometimes she would lament her “responsibilities”. But beneath the serious surface … there burnt also the…passion for art. …Once I saw her scrawl on a black door a great maze of lines, with white chalk. “When I am a famous painter-” she began, and then turned shy and rubbed it out in her capable way...She was awkward as a long-legged colt. This is how Virginia Woolf remembered her sister Vanessa Bell in correspondence that's been revived by a Smith College web site. Later in life, of course, Woolf wrote some of the finest modernist works of the 20th century. Meanwhile Vanessa became a respected painter -- see 142 of her paintings here -- and a central member of the avant-garde Bloomsbury Group. As adults, they both had a lot of cultural clout. But during another time -- during their "tomboy" years -- they were just kids looking for a good game of cricket. 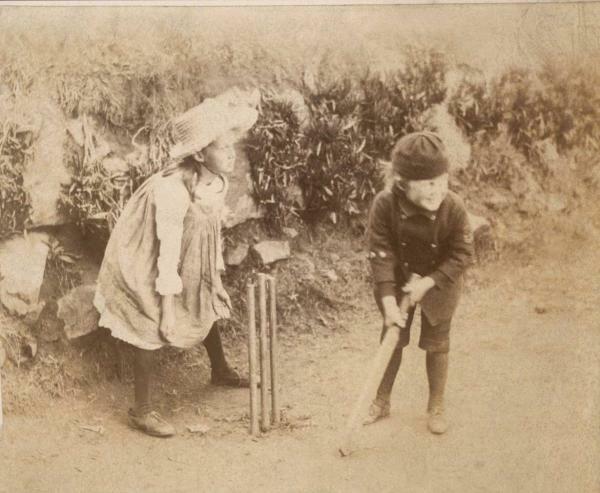 Above, we have an 1894 picture of Virginia (in the front, about 12 years old) and Vanessa, playing cricket at St. Ives. 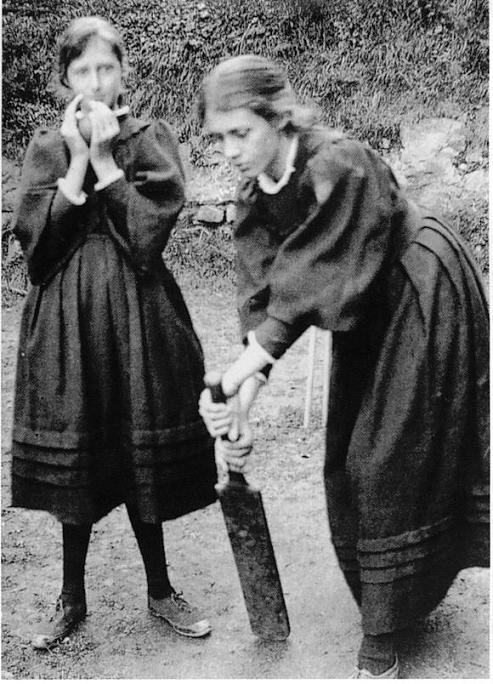 Below we have a shot, courtesy of Smith's web site, of 5-year-old Virginia playing cricket with her little brother Adrian Stephen (also later a member of the Bloomsbury Group) in 1886. Works by Woolf can be found in our Free Audio Books and Free eBooks collections. Look at the photograph of a writer at any age: the intensity, from the beginning, is always and already there. Sorry to have to say this, but seriously…. Why do you put up this trivia on this otherwise excellent site? Anyone playing any game could have a look of determination on their face, especially as others are looking on. It doesn’t really indicate anything of great meaning or value. If it was photos of a young Virginia Woolf writing at length on a blank page, that would be different. But cricket? Everyone played cricket back then. I find these pictures delightful. I’m very interested in Vanessa Bell and her life as part of the Bloomsbury group. I’m also interested in her paintings. @Alexov, by ‘everyone’ you would mean every man! women were though too demure for cricket. (english) cricket was rather misogynistic in its early years. heck women were only allowed into the ‘hallowed’ long room of Lords Cricket Ground only in 1999! so under these circumstances, tomboyish virginia woolf choosing cricket over dolls was definitely a sign of things to come !